Older homes were once routinely constructed with hardwood floors, but that practice was abandoned in the 1950s, when new technologies made wall-to-wall carpeting available. Builders were able to build more homes faster, for the post-war baby boom, and save money on labor. But today, many homeowners prefer hardwoods to carpet. 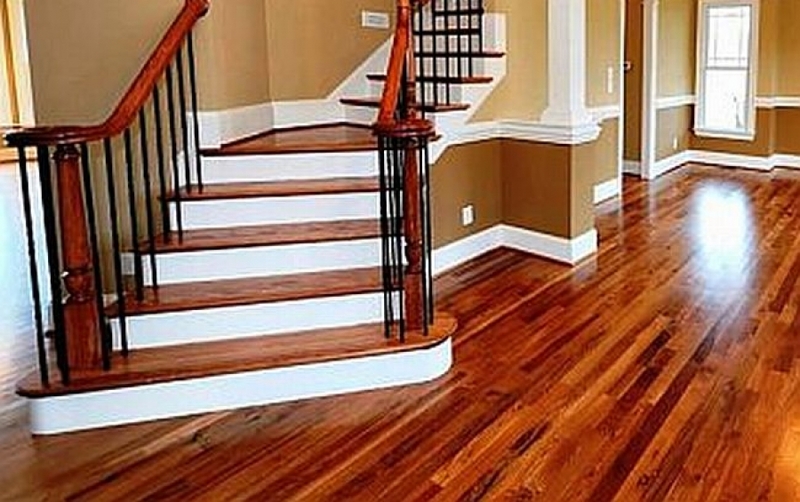 Hardwoods help give the impression that your home is well-built with quality materials. Hardwoods are easy to maintain and improve with wear, unlike carpet that eventually needs to be replaced. Hardwoods add value to your home, says the National Wood Flooring Association(NWFA). In a recent survey of participating real estate agents, the trade association found that real estate agents said that a house with wood floors would sell faster than a carpeted house, by a margin of three to one. About 58 percent said a house with wood floors would bring a higher price. If you have hardwoods under carpet, it’s easy and inexpensive to tear the carpet out and refinish your floors. Or, you can choose to install hardwoods if there’s only sub-floor underneath the carpet. Solid hardwoods — Solid hardwoods are the most expensive option. They come in planks of various lengths and are typically 3/4′ thick. The floors are installed as raw wood and sanded down and stained on site. The advantage is that your floors can be refinished often over the years. Solid hardwoods are not recommended over concrete slab foundations. Disadvantages are that hardwoods cannot be washed with water, water leaks can cause them to bow, and direct sunlight can cause stained finishes to bleach. Engineered hardwoods — Composed of layers or plies of wood that are glued together and finished with a laminate, engineered hardwoods are finished with a final layer of hardwood that is generally between ¼” and ½” thick. The advantage of engineered hardwoods is that they are suitable for any foundation. Drawbacks are that laminated floors usually cannot be refinished. Engineered hardwoods come in a variety of styles, such as long-strip hardwoods in which the flooring can be installed several “planks” at a time. Parquet floors are also engineered with strips of hardwoods laid like tiles that form patterns such as herringbone. Floating floors are planks that fit together and can be glued or nailed down to the subfloor. If your floor comes unfinished, you need to know what kind of wood it’s made of in order to select a stain, as different woods can make stain colors change tone. A good way to choose is to ask the installer for samples, or you can go to a local paint and home improvement store and view stain colors. Sherman Williams “Wood Classics” have color charts just like paint, so you can see how the stain you choose will appear on your wood floor. Keep in mind that unfinished floors must be sanded, stained and sealed on site, which is labor intensive, time consuming and messy as you wait for each layer to dry. Factory finished floors are usually warrantied, they can be installed immediately which saves time and labor, and only the glue to the subfloor has to dry. Finishes are important to choose because they dictate how you will care for your floor. If your floor has a penetrating seal, you will have to wax it to keep it burnished. If the floor is sealed with a urethane, polyurethane or other polymer coat, it’s water resistant and easy to clean with a mop. The most common woods for floors are species of oak, pine, walnut, pecan, birch, beech, ash, cherry, maple, cypress and Douglas fir. Wood for floors can be exotic, and are prized for their unusual grains and colors. Exotic woods include mahogany, teak, and Brazilian cherry. One of the most popular flooring options is actually a grass, not a wood. Bamboo is a quick-growing resource that is easily replenished, making it a good choice for green-building. Bamboo can be cut and finished like any hardwood, and is more durable in some cases.